Sir William Arrol was well known for inventing new equipment and innovative use of technology and so it is not surprising that he should venture into the motor car manufacturing business, while in it’s infancy. 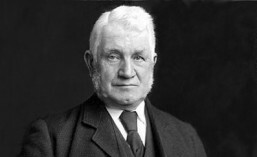 George Johnston, a Scottish locomotion engineer had been producing steam-driven engines when his attentions turned to the new petrol-driven engines arriving from the continent. With help from two other engineers, his cousin, Norman Fulton, and Thomas Murray, Johnston began to design a new ‘horseless carriage’, the dog cart. It was to be the first motor car to be manufactured in Britain. Very much like the design of a traditional horse-drawn carriage, the dog-cart had 6 seats and was of wooden construction. The difference was that it was powered by a 10hp engine which was mounted underneath the carriage and instead of reigns, the car was started by pulling on a rope. 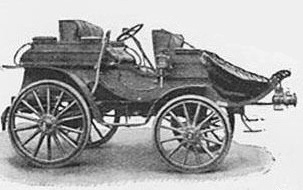 Sir William Arrol provided financial backing for the dog cart to go to manufacture and became Chairman of the Mo-Car Syndicate in 1895. It was very much a financial arrangement and production and running of the company was left to Johnston it’s founder and Director. Other backers in the Syndicate included Archibald and Peter Coats of the Paisley Thread Manufacturing dynasty. A car production works was established at Yate Street, Camlachie, Glasgow to manufacture the dog cart and in 1898 the Mo-Car Syndicate was registered with a capital of £50,000 for the business of manufacturing and selling motor cars. These very quickly became known as Arrol-Johnston cars after the Chairman and Director. The company tried to expand their market by seeking local government contracts, such as new mechanical motors for tramcars and refuse collection for the Glasgow Corporation . Despite huge respect for the Arrol name and reputation, members of the Corporation were reluctant to award contracts on the new, untested technology. Frustrated by the slow progress, Norman Fulton and Thomas Murray left the Company in 1899 and went on to found their own successful motor company, Albion Motors. Disaster hit the Mo-Car Syndicate in 1901 when a fire broke out at the Yate Street Works. The entire premises, engineering plant and cars under construction were destroyed at a cost of around £10,000. The Coats family who were investors in the syndicate stepped in and offered the use of one of their disused Thread Mills at Underwood Road in Paisley, and by 1902 manufacturing had resumed, employing about 500 people. However, the Company was struggling financially and William Beardmore, the Glasgow engineering and shipbuilding magnate, stepped in to bail it out, becoming it’s largest shareholder. He restructured the company and in 1903 brought in a new Chief Engineer, John Napier. Unhappy about the changes, George Johnston left the company and by 1905 Beardmore had bought it out in it’s entirety. He changed it’s name to the Arrol-Johnston Car Company, although by this time neither of it’s namesakes were involved in the business. An Arrol-Johnston car designed to travel on ice and snow was used in Shackleton’s Expedition to the South Pole in 1907. The Company became a pioneer of the car industry over the next decade, manufacturing cars in Paisley until 1913 when production was moved to Heathhall, Dumfries.